Documented Cases where the CMC has acted CORRUPTLY against Our Principal Russell Mathews. Documented Case of the CMC acting CORRUPTLY against Our Principal Russell Mathews. This corrupt action was part of a LAND FRAUD, to defraud our principal Russell Mathews of his home of house and land at St Lucia. He is determined to have it returned to him. Russell Mathews is still the Beneficial Owner of that property. The case we mention here has been widely publicised on the internet for a number of years. Fortunately, the many aspects of it have been writtien up and published on the net and is still public. We can succinctly link to each aspect, the facts, the individuals involved, with photos, including the select cop with a select position in the 'corruption hierarchy' of Queensland, documented evidence from the criminal public servant sector parasite parties, and the report from the CMC approving of the criminal action. We can show also criminal public sector parasites had set out to show a 'paper trail' to appear to be justified in what they had done. That 'paper trail' consisted of having something, just anything, to appear to 'justify' the criminal actions of the public sector parasites. .
Firstly, we will explain a simple but important truth. It is the difference between legislation, ie a Statute, and Regulations to that statute. Rights in Legislation over-ride 'Rights' in Regulations. This is such a basic point. It is understood by High School Legal Studies students. It is basic. It is understood by first year law students. Therefore, the 'error' by the CMC about this very point, must suggest plain corruption. You will see the corrupt or grossly incompetent Robert Walker of the CMC refers to Sec 160 of the Health Act 1937 and Section 200 of the Regulation there to. Well, we have reproduced them for you. This was part of a LAND FRAUD, and the CMC has been instrumental and culpable in attempting to cover it up. 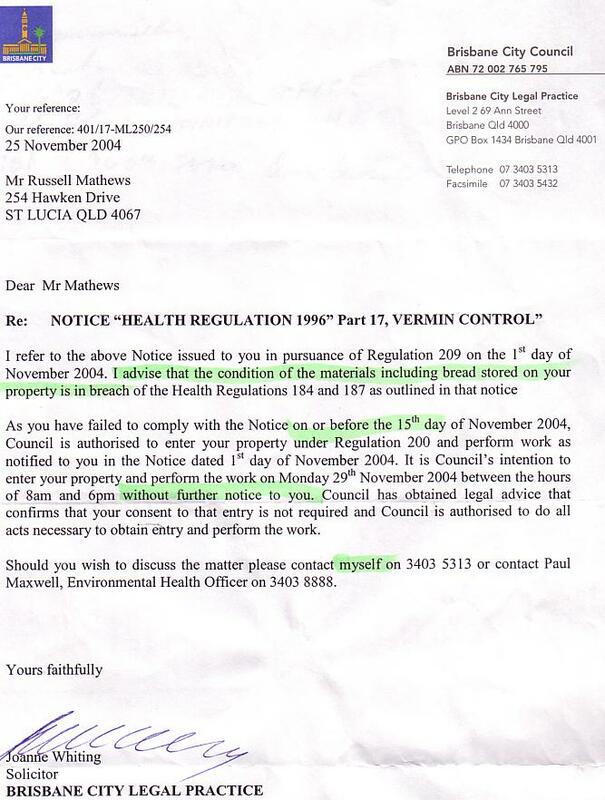 Just here, below, is the letter from the Brisbane City Council dated 25 November, 2004 to which Robert Walker of the CMC refers. It contains the clear basic error that a Regulation to a Statute [prepared by public sector parasites] can over ride RIGHTS in a Statute passed by the elected Parliament. This is particularly valuable evidence of what the Brisbane City Council did. It is the culmination of their 'Ruse' Paper Trail. They really are fools. The Ruse was to use the 'barrister's report' as 'justification' for entering without the Mandatory court order. Having no court order means that they 'broke and entered', all of them for the 'common purpose'of ROBBERY. That includes the Police officer who was specially selected to persecute Russell Mathews. By her mention of 'Council has obtained legal advice ..', Joanne Whiting waived the council's Legal Professional Privilege aka Client Privilege. That is the reason that I have obtained as much of the 'opinion', as I have. I will, intime, obtain the whole opinion as I am entitled to it , ALL OF IT, not just the portion released to me by the Information Commissioner. We have multiple examples of corruption by the Queensland Information Commissioner, who is responsible for overseeing the Freedom of Information regime in Queensland. Clearly, their purpose is consistent with all Commissioners appointed by this corrupt labor government. This corrupt labor Queensland State Government created yet another corrupt commission to further the corruption in Queensland. This is he 'Legal Services Commission'. See what they had to say about the clear basic error of the Barrister Wayne John Tolken and Brisbane City Council solicitor Joanne Whiting, which thus made them criminals guilty by Common Purpose of Breaking Entering and Stealing.